Datacard laminations are easy to install and provide and added layer of security to your organization ID cards. 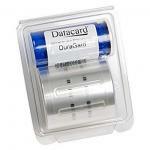 The Datacard lamination ribbons are only compatible with the Datacard lamination ID card printer models. The laminations on the ID cards make the ID cards more durable. Datacard DuraGard, OptiGram Laminate, 0.6 mil, "Geometric Curves"
Datacard DuraGard OptiSelect Laminate, 0.6 mil, "Authorized Personnel"